Still from The Duchess, 2008. The Columbia Museum of Art is South Carolina's premier international art museum and houses a world-class collection of European and American art. Founded in 1950, the Museum opened its new building on Main Street in 1998 with 25 galleries. The collections include masterpieces of the Italian Renaissance, Baroque and Rococo from the Samuel H. Kress Collection, works by significant furniture and silver makers, and modern and contemporary art. In recent years the Museum’s collection of Asian art and Antiquities has grown through generous gifts to the collection. Of particular interest are Sandro Botticelli's Nativity, Claude Monet's The Seine at Giverny, Canaletto’s View of the Molo, and art glass by Louis Comfort Tiffany. 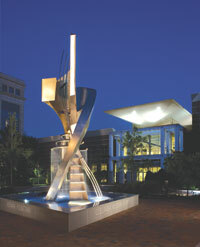 The Museum offers changing exhibitions from renowned museums and educational programs that include lectures, films and concerts, and it is the recipient of a National Art Education Association award for its contributions to arts education and an Elizabeth O’Neill Verner Governor’s Award for the Arts for outstanding contributions to the arts in South Carolina. Generous support to the Museum is provided by the City of Columbia and Richland County. $10 adults, $5 students, $8 military, $8 senior citizens (ages 65 and over). Every Sunday is free courtesy of BlueCross BlueShield of South Carolina. Free for museum members and children ages 5 and under. Tues. - Fri. 11 a.m. - 5 p.m.
First Fri. 11 a.m. - 8 p.m.
Wednesdays - Saturdays 10:00 a.m. - 5:00 p.m.
For information on group rates and tours, call 803.343.2209. Museum Shop: Open during Museum hours 10:00 a.m. – 5:00 p.m.